[Internet Brothers] Bobbie welcome. Thank you for giving us this opportunity. 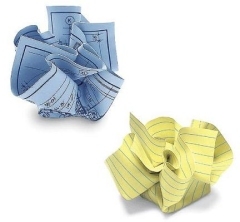 When I first discovered your work at BozGrafixs, Crumpled Papers was just a wad of notes and inspirations. How did it evolve in the beginning? [Bobbie Osborne] Thank you for inviting me, Jeff. As always, I am humbled as well as honored, not only by your request for an interview, but with the amazing talents I am surrounded by in this section of your web site. Crumpled Papers has evolved from boxes under my bed, in my closet, in my dresser drawers and my inability to organize it all. It started as an experiment into my own thoughts, dreams and aspirations — my way of finding a custom fit in this all too often off the rack world. It has also evolved from my desperate need to find empty hard drive space for more playing related to BozGrafixs. What it has become is something that has inspired others as well as myself to have fun, take the time to play and not be so neurotic with the day to day grind. [IB] CP's central theme is inspiration. Who inspired you growing up in California? Since becoming a web developer, where do you look now for inspiration? [Boz] Standing on the pedestal to thank those involved in inspiring me would make the overkill of movie awards look like a walk in the park. If you insist, though, I would have to give a great deal of the credit to my parents, who taught my sisters and myself the freedom to express ourselves with creativity. My parents are so creative. They dabbled in many forms of creativity, from philosophy to writing; drawing to painting, candle making to leatherwork. While my mother taught us the finer things in life like gardening, baking, cooking and femininity, my father taught us how to mow the lawn, build models, climb trees and reach for the stars. My mom did tell me quite recently it was out of self-preservation that she would set up tables for us to play while she did her craft projects. My father will always claim his creativity was also based on self-preservation — in a house where even the dog was female. I was taught independence from an early age. Additional inspirations came from art teachers that flunked me because I didn't "follow the rules" while secretly pushing me to be more creative in my own style. How many of us remember what it was like to be a child, where everything we created was fun — and beautiful on top of it. You know, back before we started growing up and all, the insecurities of being judged by our peers and society's idea of beauty forever changed us. Since becoming a dabbler on the Net, my inspiration comes from many sites as well as people. Mostly though, sites that show their personality and make an experience personal, and people that don't always follow the trends. You know the ones, they constantly push the envelope of learning, while remembering to have fun. My inspiration comes from the people that are willing to put themselves out and take risks with their creativity. and of course the Internet Brothers. Then, I'd have to throw in a pinch of Gazoo's Gold while sipping tea and playing with the Pixeletas. [IB] A section of your site is dedicated to teenagers. In a previous career you used to work directly with youth. You provide an entertaining forum for their creative writing and personal development. How is that project going? [Boz] Teen-Graffiti is something I could talk about forever, so please excuse me if I begin a passion filled run of the mouth on this subject. The history of teen-graffiti is one that can be traced back to about 1995 when it began as a project of the (501c) non-profit agency I ran in California. Family Alternatives to Drugs, Inc. (FAD) embraced the motto "...let's start a new FAD." Our agency was a community drop-in center that also ran peer support groups for families caught in the addiction cycle. The more we became involved with our community as an agency, the more we discovered that although youth were offered a voice, they often were not heard. It became the goal of our agency to reach out to those youth that were getting lost in a system that separated them by good kid / bad kid and subsequently made judgment calls on them. What our adult leaders tried to do was create a structured, positive safe harbor for teen expression in whatever form. What the teen support group became was a creature of it's own making. With the help of agencies like our local health department, child protection services and mental health, as well as many other community and state organizations, business's and individuals, we were funded to create a peer based community program. Using non-judgmental support, we encouraged the teens to be more community oriented by involving them in creative projects. Projects like "Christmas graffiti" where they painted the windows of downtown businesses for the holidays, or the "Letters from Santa" campaign, where they not only answered dead letters to Santa, but also raised thousands of dollars for families in need. With successes like these, as well as the publication of a teen written and produced newsletter called "sobering news" (circulation went from 1000 a quarter to 5000 a quarter within a year), the original youth support group became empowered. These teens made a dent in our community's view of "troubled youth." Suddenly, it was cool to be part of the teen support group in our community. Mentoring was embraced and schools started forming peer support centers. These teens impacted in a big way. They in essence became mentors, and with the agency backing them, they thrived. (POTS) Part Of The Solution as they called themselves, are the ones that deserve credit for creating the original teen-graffiti, even if it was for the selfish motivation of staying in touch with each other as we moved on with our lives. A few remain today as my faithful teen advisory group. When the agency sadly closed its doors, shortly after my move from California to Illinois, I maintained the conceptual copyrights to reproduce the site on a personal basis. With the blessing of the original teens and agency CEO I decided to continue the teen-graffiti web project and have helped other groups and schools implement similar projects with their youth, either in concept or by direct grant writing. This is the most heart-felt activity I will ever have the pleasure of working with. Although it is now a personal project, I will always give credit to those youth that taught me, and continue to teach me — more than I could ever begin to teach them. The site is thriving and I'm often unable to keep it up as I would like. I have personally financed this project for about three years and cannot begin to put value on thousands of hours spent by everyone involved since 1995. Very recently we were finally able to purchase a domain name through donations and private sponsorships. I am very excited for the youth involved, both past and present, as their dreams come true and the future of this not-for-profit site grows by leaps and bounds. Now, if I could get some donations of time for help with the HTML parts, we would have it made! Proceed to part 2 of Internet Brothers interview with Bobbie Osborne.